Although Serbian public opinion is used to any type of event, it has never heard a politician, especially a Minister, publicly announce that in the next few days someone would have made declarations with the intention of destabilizing the government. The Minister of Interior, Nebojša Stefanović, while a guest on one of the most popular television shows, a News Program on the Serbia public Television (RTS), spoke of possible risks threatening Serbia from nearby Croatia, which it seems is developing a missile defense system. He also referred to some internal dangers which in his opinion would threaten the country. "We have knowledge that some people are circulating false information against the Minister of Interior to prove that some Serbian journalists have been tailed", "A journalist will say that she was tailed, and she will do so in a few days", declared Stefanović, and then he continued: "The representative of a journalist association will appear in public to refer to a scandalous event even though there is no evidence that such a thing happened and in fact his story is not true." By rejecting as false something which has not yet been expressed, the Minister has passed judgement in anticipation while public opinion is waiting to see the outcome. On 12 January at a press conference of the Association of independent Serbian journalists' (NUNS), the president, Vukašin Obradović, spoke of having met on 8 January a police officer who had recently filed a complaint against the Minister, Stefanović and his assistant, Dijana Hrkalović accusing them of destroying proof of illegal tailing of a journalist at the end of 2014. In the complaint the officer stated that while he was working for the Department for Security at the cabinet of the Minister of Internal Affairs, by chance he found a document that he understood authorized the illegal tailing of a journalist from Belgrade without any orders from the Court. He informed his colleagues and a few days later, on the 15 December 2014, the order was given to destroy nine hard disks and three printers used in that department. The police officer suspects that with the destruction of this material, evidence of the tailing of several other people was also destroyed. For the moment there is no answer to the question of why the policeman only filed a complaint one year after the fact, on 31 December 2015. Obviously all this should be discussed and proven in court, but the minister and the media close to the government have already passed judgement. Again on the 8 January the influential tabloid Informer, close to the government, published the names of the journalist and the police officer who filed the complaint, thus further polluting the evidence. Obradović expressed surprise that only a few hours after his encounter with the officer, minister Nebojša Stefanović appeared in public stating that the "evidence was false". Obradović's fears are not without foundation. In Serbia, illegal tailing of important people and "enemies" of the regime bring to mind an often brutal practice in vogue in the '90s. During the bombing of Serbia on 11 April 1999, one of the most well-known Serbian journalists, Slavko Ćuruvija, was killed. For days he had been secretly tailed by members of State Security. In the same time he was publicly attacked on state media because he had criticized Slobodan Milosevic's regime. At the time the Minister of Information was actually the current Prime minister, Aleksandar Vučić. Memories of that period are still very vivid and just in the days when Minister Stefanović rejected the accusations of having destroyed the evidence, a member of the State Security who also was a defendant in the trial for the murder of Slavko Ćuruvija, gave evidence on the destruction of the documents and on the tailing of the murdered journalist. At this point, in addition to the motives that have brought the journalists to the streets of the whole country over many weeks, a new element has been added. The request that Minister Stefanović should respond to the accusations in the complaint and explain how he knew that the police officer involved in the case had met with the president of the NUNS. Journalists in Serbia have been protesting already for a month, since the minister of Defense, Bratislav Gašić, who, like Stefanović, is vice president of Vučić's party, insulted a journalist of B92 television. The journalist was retrieving a paper and went onto her knees not to be filmed. "I love journalists who easily go onto their knees", the Minister declared. For many female journalists, that was the straw that broke the camel's back. Bitter because of all the insults they continually endure from many quarters: economic pressure; dependence on advertisers close to the government; bad application of the laws governing the media; control of information; censorship and increasing self censorship; division as friends or enemies of the state. All questions that have far more impact than a sexist comment by a Minister, but it was just this which sparked the demonstration on the streets. Notwithstanding Prime minister Vučić immediately condemned his Minister behaviour and announced that he would have removed him, the protest immediately began behind the slogan, "Journalists do not go down on their knees." As of today, Vučić has not removed Gašić, arguing that he is an excellent Minister and that he is not easily replaceable. The fact that a decision of this type must be voted by Parliament and this would take place only next March, only helped to increase dissatisfaction among citizens and the media because of the failed promise. Protests started by a group of Belgrade journalists quickly spread to the whole of Serbia. 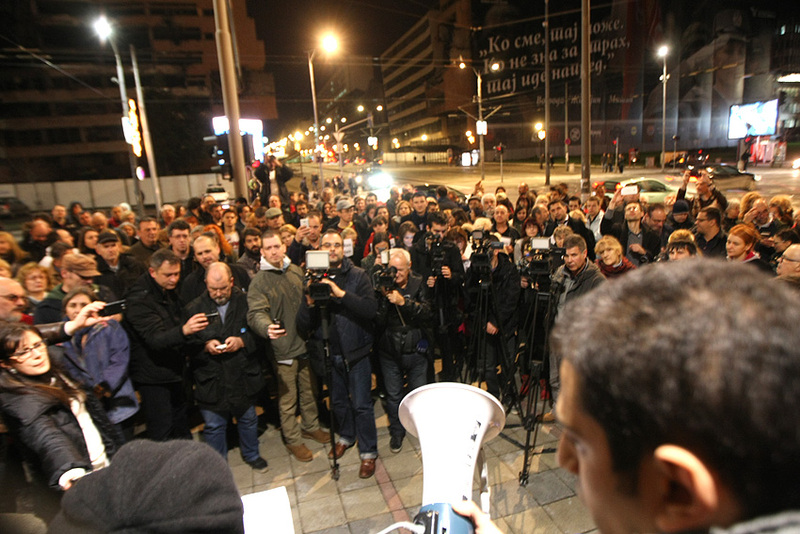 During the last demonstration, on the 8 January, the journalists and the citizens who supported them went to the streets in 15 Serbian cities. In some places they were only about ten, but in Belgrade there were 300. Independently of the numbers, the megaphones used as the only means of promotion and the improvised pamphlets caused a degree of nervousness within the government. In some cities journalists were taken to the police stations and questioned to ascertain if the demonstrations had some political connotations and if they intended to "cause provocation". The protestors were asked to inform the police of any planned gatherings, even though there was no law obliging them to do so. In some media journalists were threatened with dismissal if they joined the protest while other media only advised that it was not a good idea to take part. While dissatisfaction grows amongst journalists and requests multiply, Vučić’s only answer to criticisms about the media situation is that they only want to cause the government to fall and to destabilize the country. In the meantime, on 17 January Vučić called early elections. He made the decision at a moment when the government actually controls most of the media. How this power is used during the election campaign depends on Vučić, while to what extent he will be allowed to act depends on the journalists. Those same journalists who have decided not to get on their knees say the protest will continue.